T he new Corvette design was inspired by the Mako Shark II show car. It debuted as a 1968 model and was the third generation of the famed American Sports Car. The Mako Shark was first shown at New York International Auto Show April 1965. Designed by Bill Mitchell work on it began after the introduction and production of the first Sting Ray of 1963. As mentioned earlier GM had for over a decade created show cars to tantalize the public and often some elements of these designs were incorporated into upcoming production models. This had happened to the 63 Sting Ray which was inspired by Bill Mitchell's Stingray Racer. As usual the show car was a design exercise at the extreme. The Mako Shark had a front end clip that rotated forward much like the E Type Jaguar. It also had a full width removable roof panel. The engine choice for this dazzler was the Chevrolet 427 Cid engine. better rear visibility the overall effect was exciting nonetheless. Chevrolet removed the venetian blind slats hiding the rear window by installing widely spaced sail panels much like the styling of various Ferraris and the earlier GTO. A front bumper was also added and the V angle of the leading edge was reduced. Two taillights replaced the three on the show car. The Corvette was now famous for the hideaway headlights introduced in 1963 and from here on out it would become a design element of all production Corvettes. Some models would be adapted to have headlights that stayed in place with a clear cover for aerodynamic purposes. To keep with this trend of hiding utilitarian aspects of modern car design the wiper blades on the 68 Corvette would fold into the cowl in front of the windshield. 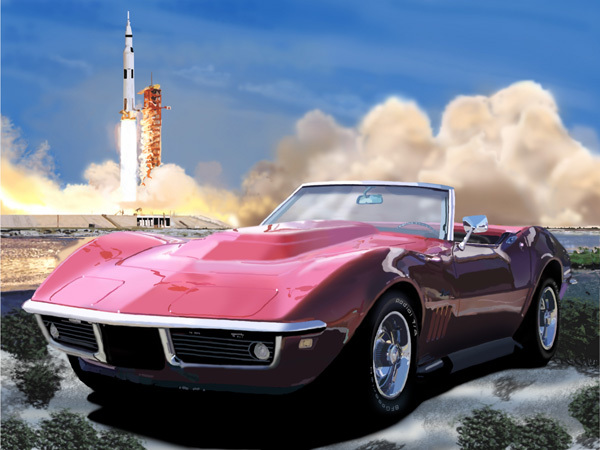 It is claimed that with the 427 engine and all the aerodynamic effort that went into the production model this Corvette was able to reach 200 mph. Besides the regular 427 there was available the L88 option and the 327 or the L71 aluminum head option.